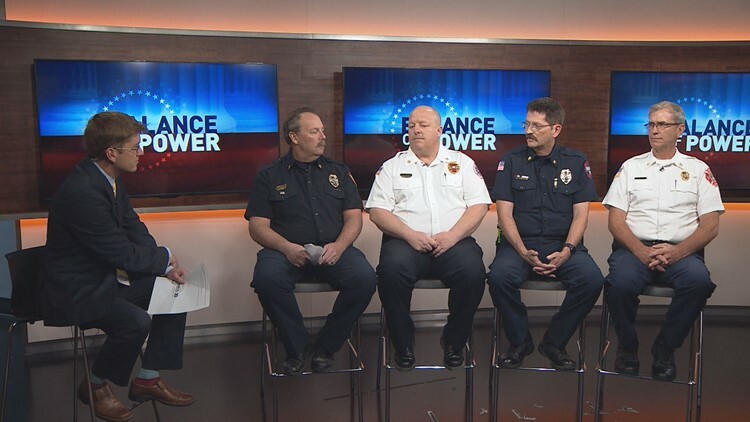 Brandon Rittiman spoke to four fire chiefs for this week's Balance of Power. There's no bill pending in the legislature right now about this issue. DENVER — A group of four fire chiefs told 9NEWS in an interview Thursday that they believe a conflict in state property tax laws will lead to deaths that would otherwise be preventable. The chiefs say they’ll have to stretch resources due to cuts caused by state laws, delaying response times to life-threatening emergencies. The chiefs of the Arvada and Elizabeth fire districts both said they will need to defer building new fire stations that are needed due to population growth. “We’re putting it on hold right now because we don’t know the full effect of this yet,” said Chief Jon Greer of Arvada fire. Colorado's fire chiefs are calling this problem the "Gallagher Fire." Instead of trees and homes, this fire is burning up their budgets with cuts. It comes from an issue with the Gallagher Amendment, passed by Colorado voters in 1982. Combined with the restrictions of the Taxpayers Bill of Rights (TABOR) it’s slowly ratcheted down the percentage of your home that is subject to income taxes in Colorado—currently at 7.2 percent. That means on a $300,000 home, less than $22,000 of the property value is actually subject to taxes. Because of the way Gallagher’s formula works, the assessment rate is projected to shrink more than a full point to 6.1 percent next year. The rate can never go back up again, thanks to TABOR—which requires voter approval of any sort of tax increase. “I think TABOR is messing up Gallagher,” Dennis Gallagher, the amendment’s namesake, told us last year. Some districts have tried to offset the decreased taxes by asking voters to approve ballot questions, but the chiefs say it can be difficult to explain to voters why they need to approve a tax increase in order to keep their tax bill for fire services from going down. The state’s association of fire chiefs has been lobbying lawmakers to help by placing four-year freeze on the 7.2 percent assessment rate—an attempt to buy some time to figure out how to keep it from continuing its long slide toward zero. “We’re getting nowhere,” said Chief TJ Steck of Elizabeth fire district. “It’s like we’ve called 911 for help and nobody’s answering,” Fletcher said. “[Lawmakers] all say they understand the problem and that we need to do something, and then we can’t get them off-center to do anything” Greer added. For sake of stability, the fire chiefs want a moratorium on adjusting the residential assessment rate to be passed this year. There is no bill pending in the legislature to address the issue, though sources tell 9NEWS there is talk of a committee to study it during the off-season and make a recommendation for lawmakers next year.